Welcome to our profile! The Town Singers is a four-part non-auditioned community choir based in Carleton Place, Ontario. Founded in 2007, the choir has grown from a dozen people getting together in a member’s living room to over 50 members. We are fortunate to have local musician Paul Norris as our choral director and local pianist Peter Brown as our accompanist. The Town Singers’ objectives are to foster the love of singing in a diverse environment, to promote a strong choir identity within our community, to enable individuals and small groups to demonstrate and improve their vocal and instrumental skills, and to share our music with the community through concerts and performances at community events. Our repertoire is ever-evolving and has included everything from pop to jazz to classical. 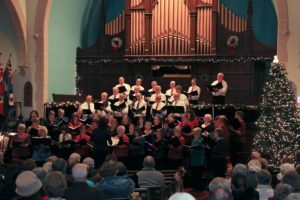 The choir performs twice a year, in June and December, and participates in events such as the Carleton Place and District Memorial Hospital Foundation’s annual tree lighting ceremony and the Downtown Carleton Place BIA’s Santa Claus Parade. The Town Singers rehearse Tuesday evenings from 7 to 9 p.m. September through December and February through June at St. James Anglican Church, 225 Edmund Street, Carleton Place. New members are most welcome.